This past week I just felt like trying something new. After puttering around the studio for a bit, I grabbed a work off the wall and decided to transform it. Sometimes you just need to stop thinking and start doing. I've always enjoyed the transparency of certain paintings. It is as if something is hidden in the background with layers of paint on top. 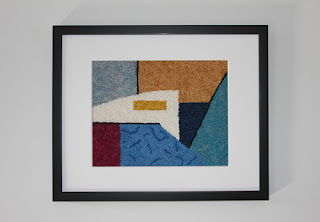 How would I do this with rug hooking? To still keep the architectural quality of the original work I decided to paint over the top. Another option would have been to place transparent fabric randomly over the top to create a barrier yet still be able to see the original through it. 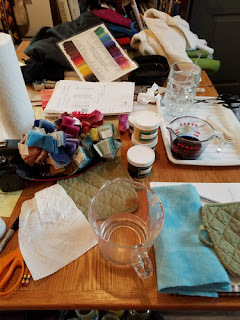 In progress on studio table. Tape strips were used in some areas and pulled off later. The painted work has much more depth, mystery and sophistication to it. I painted with no plan in mind, which always makes me a bit apprehensive. Sometimes we need to leave our comfort place to grow. When the work was completed it reminded me of walking through Asheville and viewing the work of the many local potters through a window with reflections of buildings, perhaps a rainy day. Thus the work was titled "City Walk". Framing can make a difference in how art is perceived. Unlike paintings, which can be simply placed into a frame, framing textiles can be a bit more complex. I have been framing works open for a few years now and the tides have changed. More people are asking for work protected by glass or acrylic and over 90% of sales the past year have been pieces under acrylic . Some of my latest work will be placed in an office environment. 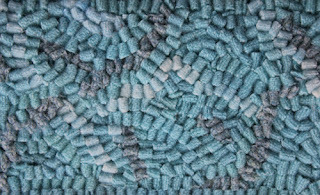 Cleaning and wool dust can become an issue. Two hospitals decided against open work due to the dust and allergenic problems. Unfortunately, the work could not be reframed under acrylic in time for their scheduling. Results: lost sales and framing under acrylic for future sales. There is the perception of textile art being difficult to care for. I have found this to be true depending on how the work is made. A mixed media work I purchased with quite a bit of bulk to it and nooks and crannies between tied rope does require a lot of upkeep as dust gets trapped. The rug hooked works I own require a lot less upkeep. I simply use a lint roller and it cleans them quite nicely. Glass or acrylic can eliminate the problem, though these works should still be removed from the frame and cleaned every 2-3 years. 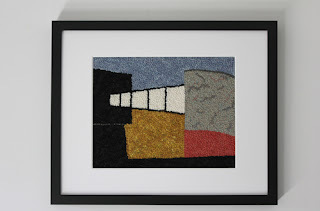 The works shown here have been stitched to acid-free foam board before being placed in the frame. An acid-free mat board has been used and uv acrylic placed on top. The frames have a 1" rabbet (the depth of the back of frame where work sits) to allow for the depth of textile work and setting it back so as not to touch the acrylic. 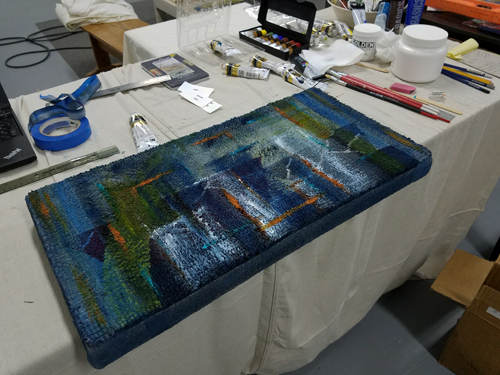 When setting the work back from the acrylic, foam board was cut in the shape of the mat board, though narrower, and placed behind the mat board to create depth. 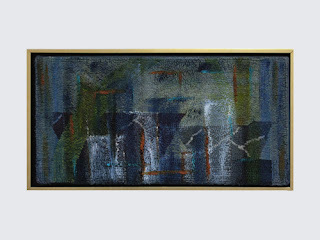 Acrylic can be static which causes problems with wool. Remove any wool bits or dust from the work before framing (this is time consuming as it sometimes needs to be repeated during the framing process, don't skip this step as wool dust on a mat board looks unprofessional). There is acrylic cleaner that can be used to minimize static (I use Brillianize Plastic Cleaner). Use a microfiber cloth when applying cleaner or dusting the acrylic to prevent scratches. Note: Always take photos before glass or acrylic is installed if possible. This prevents glare. Whether one decides to leave a textile open or place under a protective cover is an individual decision. Present work to show it off at its best. 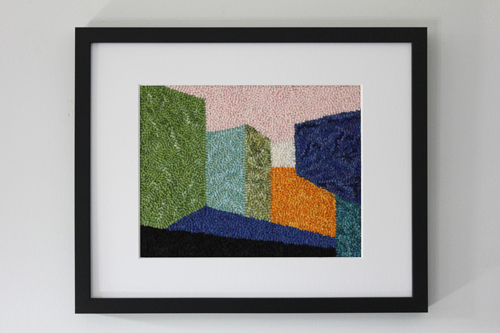 If similar works (such as a series) will be exhibited together it is best to frame in a similar way for cohesiveness. 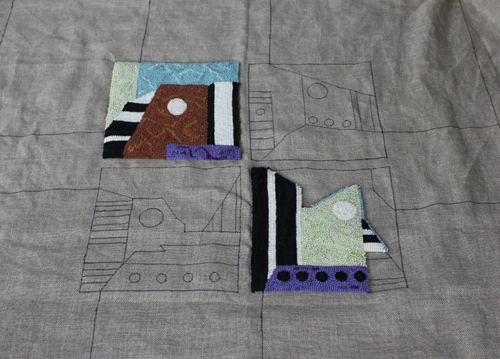 Work on the first square continued and a second was started. 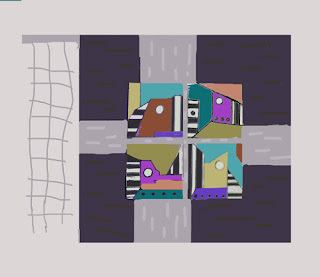 The color planning allows for squares located diagonally from each other to be in the same color scheme. This was work completed as of Wednesday. The majority of colors are fairly bold and the light green adds some softness. The mixtures of wool add more interest as the viewer gets closer to the work. 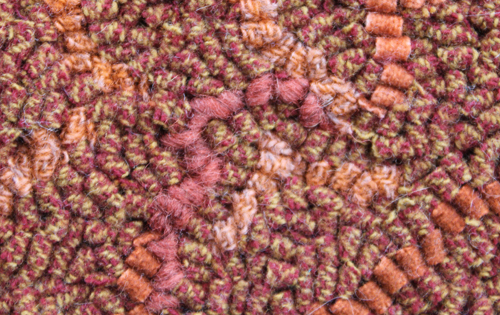 The rust contains a bright, a texture and a dark yarn. 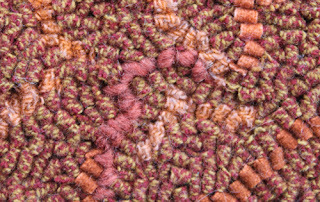 A main color (the texture in this case) is usually chosen and then leftover strips from previous projects are used to add variety. 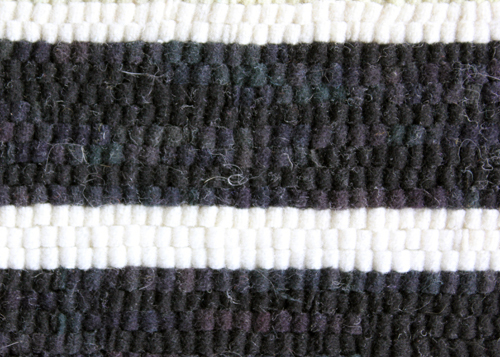 In rare cases, there may be some dyeing needed when the right color strips are unavailable. 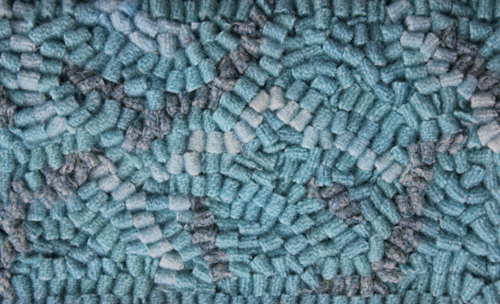 For the turquoise, a mottled light, a plainer medium, and a textured dull gray-turquoise were used. 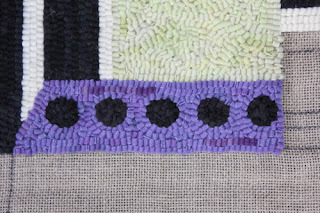 Small black circles were hooked with the purple. These smaller circles will appear on three of the four squares, with the upper left square containing a redder purple meandering throughout rather than having the black involved. This adds a bit of a surprise as the expected similarity to the other squares is not there. 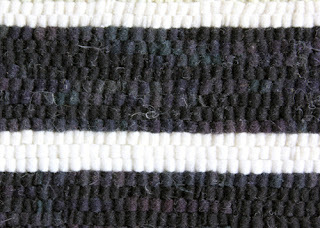 Straight hooking is being used for the black and white sections. Black and white together is bold. The straight hooking adds to the boldness, showing stability (horizontal) and strength (vertical) while framing the center areas. While I find myself delving more and more into the reasons for my choices, I don't get bogged down with it. Sometimes a choice is simply: "I just liked those colors together." 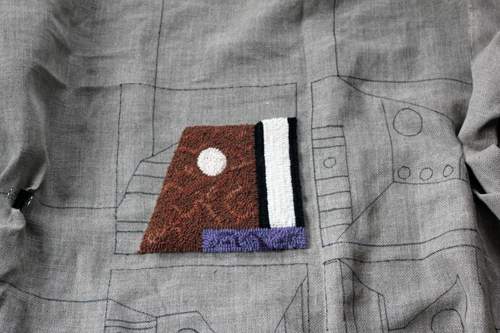 or "I felt like hooking straight after hooking meandering patterns for so long." Not everything is complex. It is important to keep in mind the effect of your choices, but it is also important to enjoy the process and just let go once in a while. The urge to work on a larger piece hit me this week. It started with four sketches done on our Maine vacation. 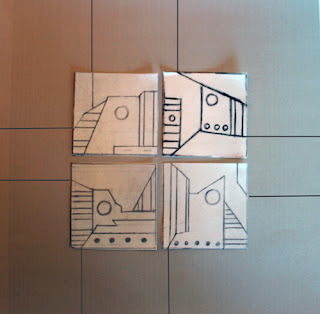 They were photocopied at a smaller size and moved around on a larger piece of sketch paper until they worked as a grouping. The background was drawn in to create an off-center intersection using a continuation of lines in the four sketches. 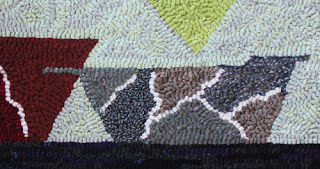 The piece is a combination of the road designs I've worked on and the new architectural works currently being hooked. 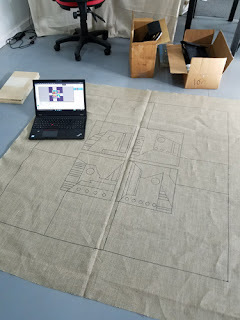 A photo was taken of the sketch and it was placed into Photoshop to work with colors and further design ideas. The plan is to add rebar to the left side of the hooked work along with a piece of wood to attach it to for hanging. This may end up being too much weight. If so, metal fencing or another material will be used. 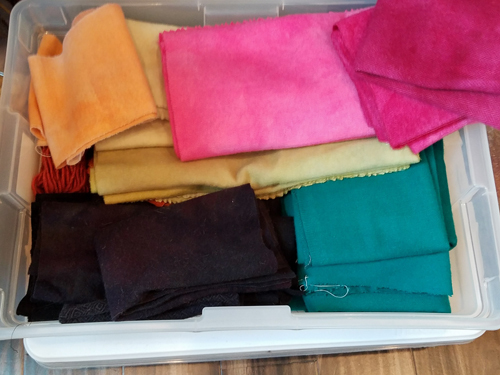 Some of the colors ready to go. Hooking was started in a 6-cut. Work will continue next week.